Plan to celebrate your child’s next birthday or any other special event at LaCamas Athletic Club; enjoy the outdoor sun deck or the front lobby, and the indoor pool area or 1/2 the gymnasium. Each area has it’s own unique features. The right place for your next celebration is LaCamas Athletic Club. The first hour, choose the Lobby or the front Sun Deck. The second hour choose between the recreational pool or 1/2 the gymnasium. We’ll provide tables and available play equipment. You’re welcome to decorate your activity area any way you like (as long as it’s not permanent!) and bring in refreshments, birthday cake, and beverages (alcoholic beverages are not permitted). We’ve got a refrigerator you can use while you’re here. Lobby: The Lobby is the choice for most winter parties. It had tables for serving cake, opening presents etc., and is available for your non-exclusive use during your event. Sun deck: Our sun deck is perfect for social gatherings with friends, family, or even co-workers. The fully appointed sun deck is complete with picnic tables, umbrellas, and deck chairs. The sun deck also offers direct access to both the lap pool and the recreational pool. This area is available in the spring, summer, and fall. Aquatic Center: Our pool area offers the best in water-play amenities including two separate pools and for the adults in your party, a hydro-spa jacuzzi. The recreational pool begins at a shallow 4 inch depth, allowing even your youngest guests to enjoy the pool. A 40 foot water slide is a big hit with more confident swimmers. Life jackets are provided for non-swimmers. Our 25 meter lap pool, complete with tile lane markers and targets and the hydro-spa jacuzzi (available to guests 14 years and up) round out our full complement of amenities in our Aquatics center. 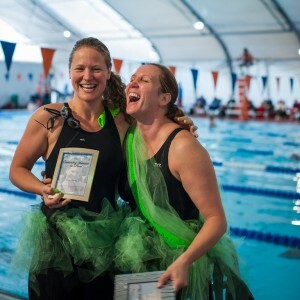 The Aquatics Center is available for your non-exclusive use during your event; you may be sharing the area with other club members and their guests. Gymnasium: Groups can take advantage of 1/2 our gymnasium for organized games, basketball, or volleyball. Available play equipment for the gym includes a wide selection of play balls and 4-wheel scooters. This area is available for your exclusive use during your event. Schedule your event with a LaCamas Athletic Club staff member at least 10 days in advance and pay the rental fee at the time you make your reservation. Reservations are made on a first-come, first-served basis. Party host must be in attendance at the event. Host responsible to tidy up after the event, including sweeping the floor, wiping down all tables, and benches; bagging garbage and taking it to the dumpster. Failure to complete clean-up will result in an additional $50 janitorial charge. Party host is responsible for actions of all guests. If you need to change your event for any reason, try to provide at least 24 hours notice in order to reschedule your date and or time. There are no cash refunds for any reason, but we will do our best to reschedule your event as needed within 90 days. For membership questions, contact us here! STUDENT SHORT TERM MEMBERSHIPS ARE ALSO AVAILABLE. SEE A MEMBERSHIP SPECIALIST IN CLUB FOR MORE INFORMATION ON STUDENT MEMBERSHIPS. ADDITIONAL FEE SERVICES:Swim Lessons (Group and Private), Swim Team, Tanning, Parties, Hot Locks Hair Salon, Confident Driving, as well as Team, Partner and Personal Training are a few of the additional fee services available. If a membership card needs to be replaced, there is a $8 card replacement fee.